In all their desperation Christian missionaries have now started to claim that according to the Quran Paul was a prophet of God. Their conclusions are based on conjectures and the misrepresentation of the text of the Qur’an. Simply put, there is not a single place in the Qur’an which even mentions the name “Paul” let alone mentioning him to be a prophet of God. To make such claims the Christian missionaries run to Tafsir Ibn Kathir. They read out the tafsir by Ibn Kathir regarding the 14th ayah (Verse) of the 36th Surah (Chapter) of the Quran. 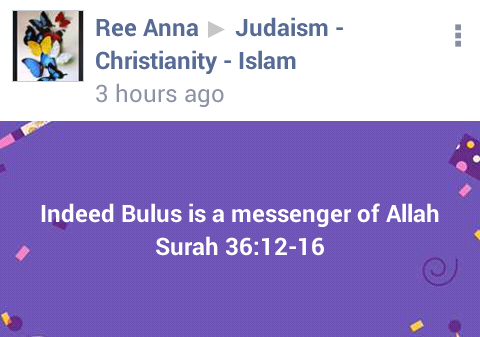 Christian missionaries say that Ibn Kathir says in his Tafsir of the Quran that this verse refers to Paul of Tarsus and thus Paul (Bulus) is one of the Messengers of God according to Islam. Let’s see whether Ibn Kathir makes such a claim. But the question is this Ibn Kathir’s view? Note: No Bulus (i.e. Paul) mentioned here. Later on Ibn Kathir in his tafsir refutes this and says that according to the proceeding Qur’anic verses the people were destroyed. Historically there is no evidence that the city of Antioch faced such destruction and thus this cannot even be about the city of Antioch. Now let’s check Qurtubi whom these missionaries have labeled to be “The Number 1 Muslim Imam”. Al Naqash said: Saman and Yahya – Did not mention Sadiq and Saduq. Note: Qurtubi does not mention any Paul (Bulus) either. (When We sent unto them twain) two apostles: Simon the Canaanite and Thomas, (and they denied them both, so We reinforced them with a third) We strengthened them with Simon Peter who confirmed the message conveyed by the other two apostles, (and they said; Lo! we have been sent unto you. Note: No Paul mentioned over there either. What we have done here is basically refuted the idea that the Tafsirs unanimously agree that one of the three people sent as messengers was Paul. There is a difference of opinion among the scholars of tafsir which is evidence that neither the Qur’an mentions the name of Paul as one of the messengers nor did Prophet Muhammad ever mention his name with regards to this verse. Does The Verse Really Talk About Messengers (Rasul)? Now we will go on to refute the idea that the verse is talking of a Rasul of Allah. The Arabic text of the Qur’an clearly shows the word used for these three to be “mursaloon”. Mursaloon which is the plural of mursal means “sent one”. This word has been highlighted in the concerned verse above. Rasul (pl. rusul) in Islam has a specific definition. Generally the word means:ambassador, messenger, envoy, emissary, forerunner, apostle, and courier. The same word “mursaloon” has been used. So does this mean that the messengers that Bilqis sent were RUSUL? Again the same word “mursaloon” is used. Does this mean that the angels which came to Lut were RUSUL? And they say that look Muhammad was also only a messenger like the other three. But if we read the verse of the Qur’an we see that the word used here is “rasul” and not the general term“mursaloon”. A general term for messenger was used for the three people in 36:14 but for Prophet Muhammad the special word“rasul” has been used in this verse. This part of the verse talks about the previous rusul of Allah. And in the Arabic text, for them, again the word “rasul” is used and not the common word mursaloon. Hence clearly the three that the Quran is talking about in Surah Yasin (36) verse 14 were not “rasul” but messengers (the sent ones) sent by Jesus on the directive of Allah. Let’s give an example to make things clearer. If Allah informs Prophet Muhammad (sallallaahu alayhi wasallam) to send Omar (radhiyallahu anhu) to Persia for Da’wah does that not mean that Omar (radhiyallahu anhu) is a messenger (mursaloon)? Of course he is a messenger! But it can never mean that he is a rasul! Similarly these three were not rasul but were only messengers sent by ‘Eesa alayhissalaam (Jesus) (on the directives of Allah. Clearly when a Rasul of Allah (i.e. Jesus in this case) sends a messenger (i.e. Paul, Shamoun, Yuhanna or any of the other names mentioned by scholars in this case) to another city, God knows that they have been sent. It does not mean that God actually chose them to be rasul and sent them. It has clearly been refuted that according to the Qur’an or the Tafsir Paul was a Rasul of Allah. For the final blow to the deception which the Christian missionaries try to create let us take a look at a hadith of Prophet Muhammad (sallallaahu alayhi wasallam). Narrated Abu Huraira: I heard Apostle saying, “I am the nearest of all the people to the son of Mary, and all the prophets are paternal brothers, and there has been no prophet between me and him (i.e. Jesus).” – [Sahih Bukhari Vol.4, Book 55, #651] This hadith has also been recorded in Sahih Muslim and Abu Dawud. The whole idea of Paul being a rasul of God has been defeated in this article. 1) The verse 36:14 does not talk about a rasul but only about mursaloon. 2) Whether the verse in question refers to Paul or not is a matter of interpretation and clearly there are many scholars who don’t even mention Paul’s name in their tafsir of this verse. 3) Ibn Kathir himself refutes the claim of the city being Antioch. 4) According to Sahih Hadith it is clear that between ‘Eesa alayhissalaam (Jesus) and Prophet Muhammad (sallallaahu alayhi wasallam) there has been no prophet and hence Paul could have never been a prophet. 5) Even if, for argument’s sake, we would say that according to Ibn Kathir Paul is a Rasul of God, no tafsir can supercede the authentic hadith. This would be Ibn Kathir’s interpretation and Ibn Kathir was a man and not a rasul of God hence his word can never be taken over the word of the Prophet Muhammad (sallallaahu alayhi wasallam).